Q. What is a Good Any One Day ticket (general admission/grounds ticket)? A. The Good Any One Day ticket gives the holder access to the tournament grounds (golf course). You can follow your favorite players, sit in the general admission stands and enjoy food at concession stands. It does not provide admission into the corporate hospitality areas or the clubhouse. Hospitality tickets are available for purchase for an upgraded experience. Clubhouse tickets are not available for purchase. A. Parking is available for spectators at River City Community Church (16765 Lookout Road) for $10/car. A free shuttle service will commute you back and forth to the main spectator entrance at the Valero Texas Open. View the Parking page for further details and options. Q. Once I am at the tournament, what's the best way to see the action? A. You can either follow a group around the golf course or stay on a particular hole and wait for the groups come to you. There are public bleachers located around the course at various holes. Make sure you pick up a Spectator Guide upon entering the golf course so you can keep track of where each group is on the golf course. A general rule of thumb is that it takes each group 15 minutes to play a hole. Q. What is a Spectator Guide? A. The Spectator Guide provides the pairings which lists the groupings, starting times and starting hole, in addition, to the course map and other useful information. Q. What should I wear to the golf tournament? A. You are welcome to bring a collapsible, folding chair. Items not allowed include: chair bags, lawn or over-sized chairs, nor seat cushions. A. Still cameras with a lens smaller than 6 inches are only permitted during the Pro-Am portion of tournament week, Monday, April 16th and Wednesday, April 18th and Tuesday during the practice round. No cameras are allowed beyond Wednesday. No camera bags are allowed. Q. Can I bring a Cell Phone? A. Mobile devices (cell phones, tablets & PDA’s) are permitted at the Valero Texas Open. Patrons must keep their phone in SILENT mode and may only use their phones in designated "Approved Cell Phone Areas" to take calls. Q. What is a Pro-Am? A. The Pro-Am is a tournament in which both professionals and amateurs play together as a team. 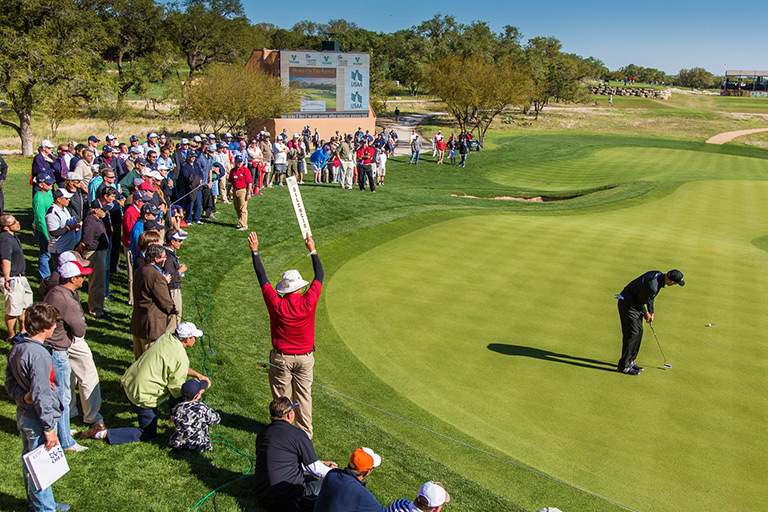 The Valero Texas Open hosts three Pro-Ams during tournament week. Q. If it is raining will the PGA TOUR players still play? A. PGA TOUR players will play in the rain unless there is a threat of lightning in the area. If that is the case, players will be evacuated and the gallery will be asked to seek cover off the golf course. Q. Will I be able to get autographs? A. Players should not be asked for autographs during play. Most professionals will sign autographs before and after play. 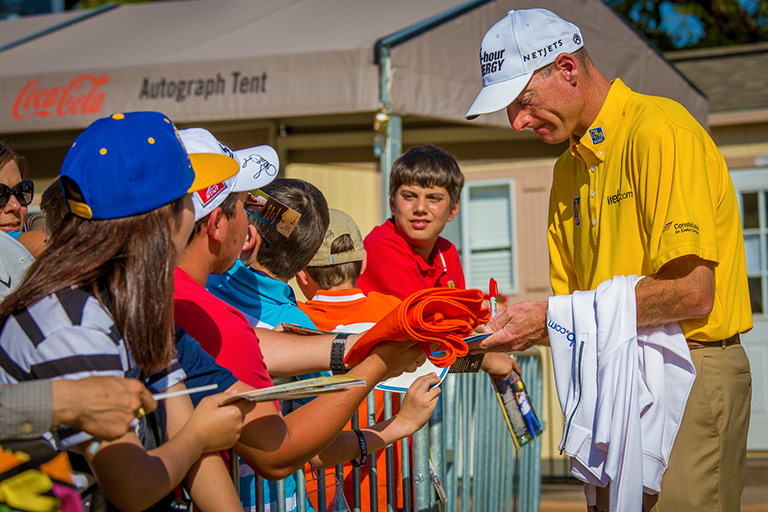 Stop by the Autograph Zone (located on your course map within the Spectator Guide) for autographs from your favorite players. Q. Can I purchase food and beverages at the tournament? A. 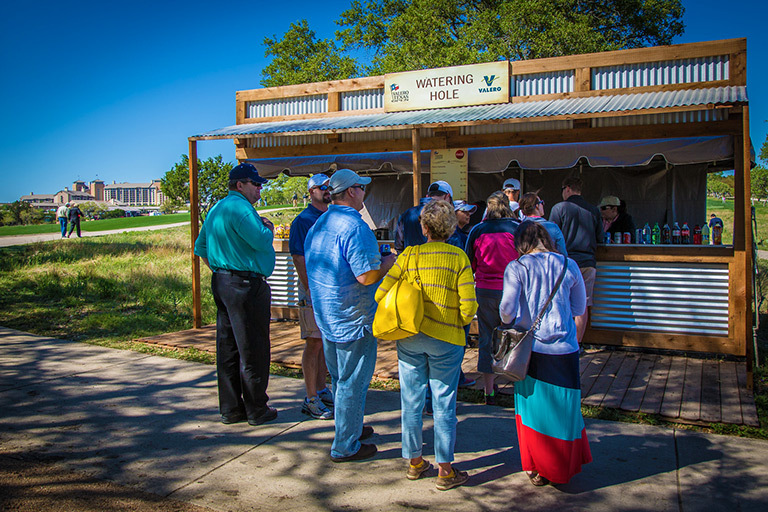 Yes, concession stands are located throughout the golf course. Coolers are not allowed. Q. What accommodations do you offer to those wheelchair bound? A. ADA parking is available at River City Community Church. Click here to learn more. Q. Where is Lost & Found located? A. Lost & Found is in Gatorade Fan Fest at the Item Check Tent, near front entrance. Q. When attending the Valero Texas Open, who should I contact in case of an emergency? A. Should a problem or emergency occur, contact any uniformed tournament Marshal or law enforcement personnel in order to expedite medical assistance. First Aid tents are displayed on the course maps found in the complimentary Spectator Guides. Q. 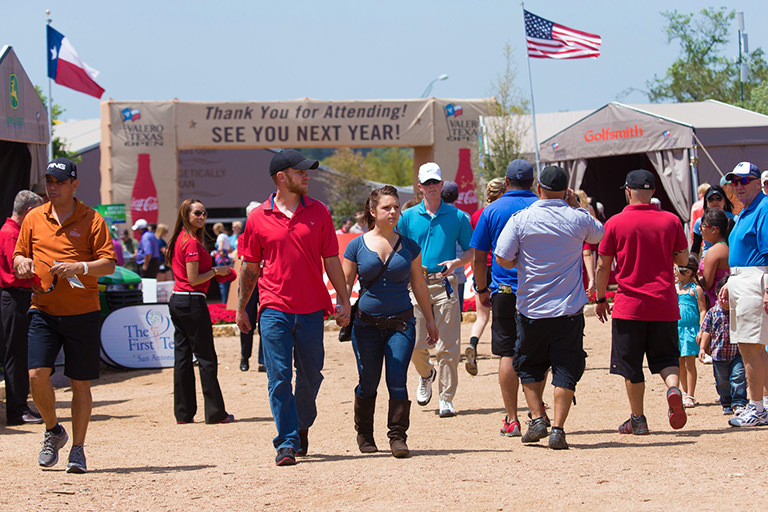 What should I do if I experience inclement weather while at the Valero Texas Open? A. In the event of thunderstorms, lightning, or other severe weather, "Weather Warning" information will be displayed on the electronic scoreboards around the golf course. If inclement weather is approaching, spectators are advised to take precautions prior to play being suspended. If the siren sounds, seek shelter immediately. Q. Are there other items that I may bring with me? Q. Is there anything prohibited that I shouldn’t bring with me? No firearms or weapons of any kind - Please do not bring them or you will be required to return them to your vehicle.